Spanish Smoked Paprika has a unique flavour – think “more smoke” and “less paprika”. The VegHead has no recollection how, where, when, or even why a tin of this first came into the larder, but ever since it did it’s been in regular use. Get a tin. You cannot replicate the flavour by using standard paprika and just nipping outside for a quick puff. 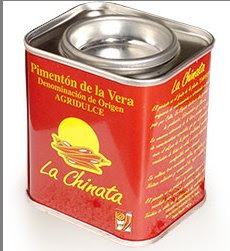 There are other brands than “La Chinata”, however this happens to be one that we used first and have continued using ever since. It is widely available both online and in most supermarkets, and wherever good smoked paprika is sold. This pinto bean curry is flavoursome, but not too hot. If you wish to add heat, add 1/2 a teaspoon of your favourite dried chilli powder, or one chopped fresh chilli. Serve with a grain like quinoa, millet, couscous, or barley couscous, or even a side of wok seared spinach and ginger. add the celeriac, pepper and paprika. Cook over a low heat until celeriac is medium soft.